Vocabulary instruction tends to be humdrum and predictable not only for students, but for teachers, as well. Recently, the Oxford Dictionary added 500 new words to it’s pages. If I find this fact interesting maybe my students will, too. Think about inspiring your students to have some fun with vocabulary by learning new words recently added and researching why. For instance, Miley Cyrus didn’t invent the term “twerking.” It dates back to the 19th century and was originally spelled “twirking.” In 1820 it was considered a combination of the words “twitch” and “jerk.” The Oxford Dictionary updated the spelling recently to reflect the times. 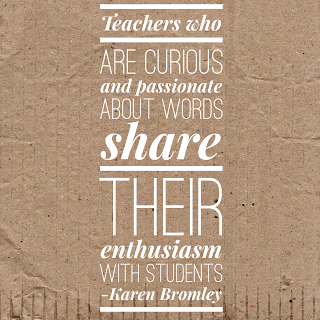 Karen Bromley in “Nine Things Every Teacher Should Know About Words and Vocabulary Instruction,” suggests that not only should students find new words added to the dictionary, but take it a step further by having them create a list of words they think should be added. Relating vocabulary to daily life, helps students develop a deeper relationship with word meaning. Bromley, Karen. “Nine things every teacher should know about words and vocabulary instruction.” Journal of Adolescent & Adult Literacy 50.7 (2007): 528-537.